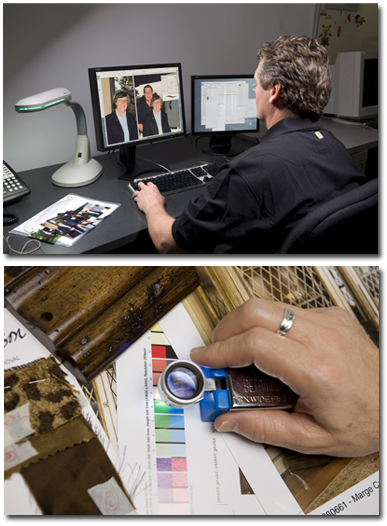 An essential step to completing high-quality print product is file preparation. At Queen Beach, we assess and process each of your digital files through a number of quality control checkpoints. Enhancement or corrections can be made at this point and output to our Epson Digital Color or Fuji Digital Halftone Color proofers for your final approval. For tips on how to best prepare files, go to the Tools section. Years of color retouching experience enable our technicians to apply skillful, creative improvements to supplied images. We have the ability to make the sky bluer, the grass greener, flesh tones warmer, or fabrics and wood tones match actual swatches. We can effortlessly smooth wrinkles from the CEO’s suit, or perhaps even remove a few laugh-lines. Just ask us how we can polish your images.